STRESSLESS is the high performance carrying rope from TEUFELBERGER for material handling systems. Its most outstanding feature is its durability. If you are looking for a reliable carrying rope for material handling, then STRESSLESS from TEUFELBERGER is your rope of choice. Our carrying ropes can be used for standard unidirectional aerial systems for material handling. For example, the TEUFELBERGER carrying ropes are employed in the oldest material ropeway in Lukovac (Bosnia), conveying approx. 150 tons of soda per hour over a distance of 14 km. Moreover, our carrying ropes are also suited for special applications on cable cranes. 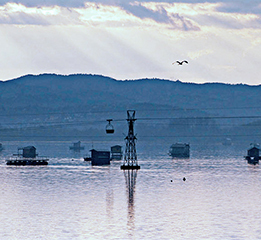 They are used, for example, at the world’s biggest barrage, the Baihetan Dam in China, where they move up to 7000 tons of concrete per day, withstanding extremely high loads. In the field of passenger transportation, safety and reliability play a crucial role. That is why many world market leaders in this field opt for our STRESSLESS carrying ropes. The basis enabling our STRESSLESS ropes to cope with the challenges they are exposed to as carrying ropes is the proven sliding guide process. For more details about this method of wire forming and the related STRESSLESS technology, please click here. Our STRESSLESS rope is also available as carrying rope with integrated fiber optic bundle (STRESSLESS DATA) and with electric conductor. Our STRESSLESS rope is used worldwide as carrying rope in material ropeways and on cable cranes. 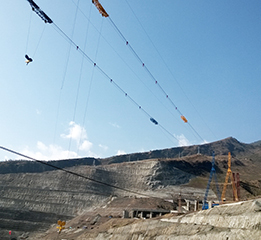 Customer: Hangzhou Guodian Dali Mechanical & Electical Engineering Co. Ltd.
For the erection of the Baihetan Dam in China (expected completion in 2019), one of the world's tallest barrages, a temporary cable crane was installed. This cable crane uses carrying ropes from TEUFELBERGER. All in all, 611 tons of ropes were delivered.